Those of you familiar with this blog, already know about my passion for Japanese gastronomy. 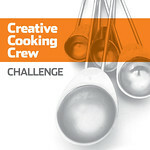 I simply love it; every recipe, dish, preparation is a work of art. It’s about flavours, textures, colours… I do admire the simplicity/complexity and the beauty they achieve in every single dish! 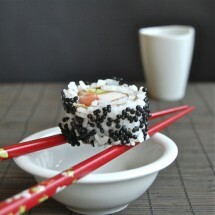 I’ve been wanting to do these Sushi Temaki for a while now, and to be honest, they are not that difficult to prepare. 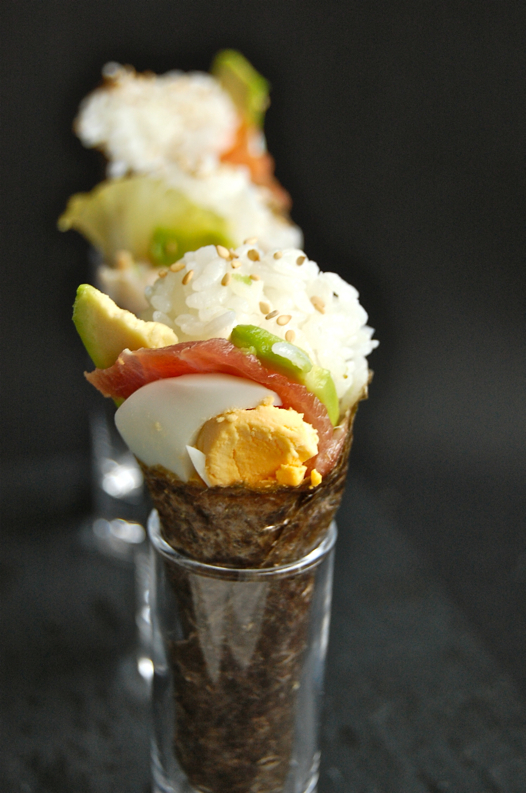 Temakis are as delicious as Maki Sushi and you can surprise your guests with even more ingredients. This time I tried with: tuna, shrimps, boiled egg, avocado, lettuce, sesame seeds… but you can also try with beef, carrot, red pepper, omelet… just combine those flavours you think that would marry with rice, and there you are! If you are a handy person, you will find no trouble in wrapping the ingredients in the nori algae. Make your table look like a sushi forest!!! I don’t know what is more pleasant: preparing temakis or eating them? You tell me ;D.
Ingredients for 4 servings: 8 nori toasted algae, for the rice preparation: 350 grs of Japanese rice, 420 ml of water, 5 tablespoons of rice vinegar, 2 tablespoons of sugar, a bit of salt. And to fill the temakis: Some fresh lettuce, 2 boiled eggs, 200 grs of tuna, 200 grs of salmon, 1 avocado, some shrimps (you can have them lightly fried or raw), toasted sesame seeds and soja. Feel free to use your favourite flavours/ingredients. Prepare the rice. Find detailed steps here. Cut the algae in two pieces. 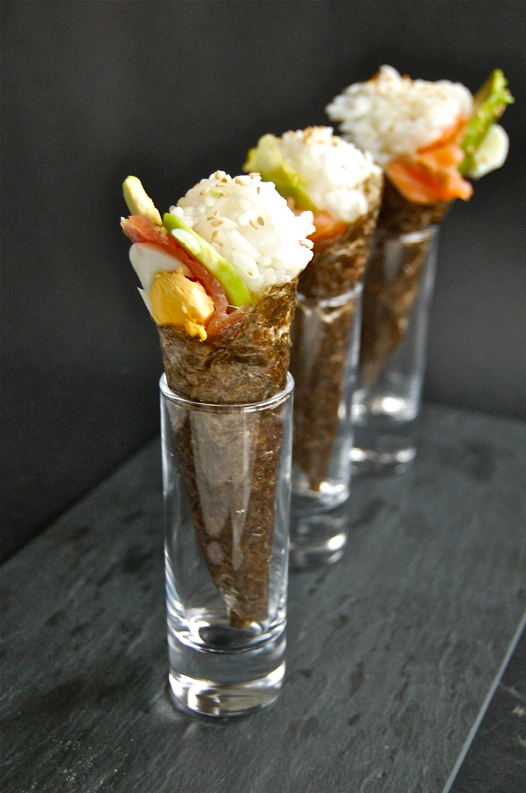 Prepare the rice cones with your wet hands and place on the nori algae. Add the ingredients you want in every temaki. Wrap it while making a cone's shape with the algae and seal with a grain of rice to keep it closed. There you are! 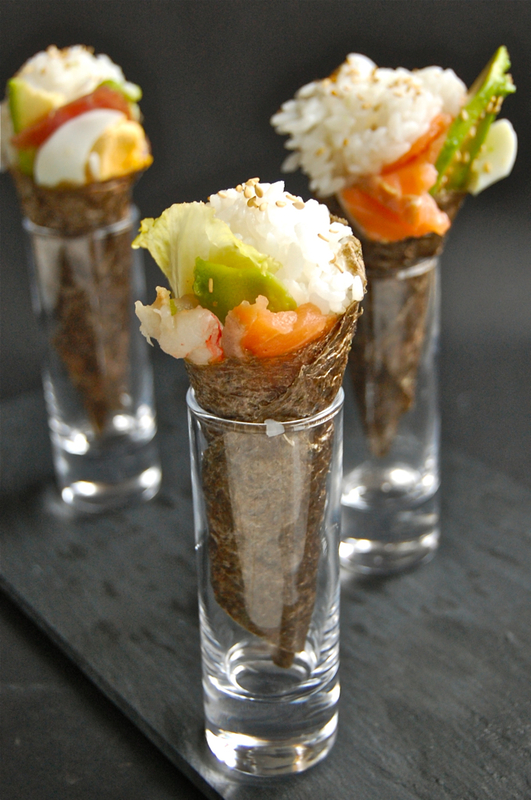 Place temakis in narrow glasses or lying on the dishes and use some soya sauce to dress them. Make sure you have frozen/defrost all raw ingredients. 06/19/2012 · 10:44 h by Platanos, Mangoes & Me! These are absolutely gorgeous. 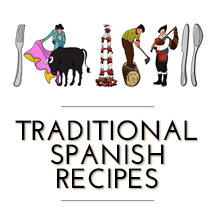 Next time in Barcelona I am going to ask you to make them for me. Miss you mucho! I miss you too, bombón!!! 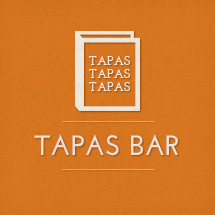 Next time you come to Barcelona, vas a comer a la carta en mi casa!!! Met Joan on Sunday… she is awesome :D and it felt like old friends :D.
Lots of kisses to you and Phil. So simple and yet so complex and delicious. Yum! SUper amazing presentation…I love the way you have beautifully presented your dish. Makes it all the more delicious! Your blogs are totally worth gift quantify and liveliness. Well, I’m back in Florida and have about 1000 blog posts to read! This one is a treat. I too love sushi and Japanese gastronomy and I love your presentation. Muy bien hecho! Sushi. 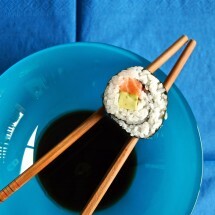 A recipe for Futo-maki sushi and more.